We are under way southbound in the Chesapeake, offshore of the Middle Peninsula of Virginia. This morning found us anchored in a small bay off the Great Wicomico River (map), at the northeast tip of the Northern Neck. Friday night (actually, early Saturday morning), after I had posted the blog here and on my way to bed, I spotted a cruise ship steaming past, upriver on the Potomac. It was the American Constitution, on her way to The Wharf in DC. We left just a day too early to catch the first cruise ship of the season. I had noticed cruise moorings along the new main pier at the Wharf and wondered if they got many calls. A quick search revealed she would stay in DC one day, then spend the next at Mount Vernon. Sure enough, MarineTraffic shows her anchored right where we once did, across from George Washington's estate. Tomorrow she'll cruise back downriver in the daytime, since her upriver cruise was at night, depriving the passengers of the view. The brochure says a ten-day cruise is $5k per person. That provides some perspective on what it costs us to cruise our own boat. We weighed anchor fairly early yesterday morning to catch the last of the ebb downriver. The day started nicely, but as it progressed, chop and wave height built steadily, until we were in three foot rollers. Fortunately they were from dead astern most of the day, and we opted to just continue downriver and make the turn into the Chesapeake and into the lee of the Northern Neck. Sunset last night over the Great Wicomico, just after dropping the hook. As we were on the last river leg, the long, straight shot from Ragged Point to the mouth at Smith Point, we heard a familiar voice on the radio. Long-time readers will remember we stored our bus, Odyssey, at Olverson's Marina on the Yeocomico, in the little town of Lottsburg. As we were passing the mouth of the Yeocomico we heard a boat hail the marina, and our old friend Fred Olverson answered. At a more leisurely pace we would have stopped in for a night, which Fred provides free to MTOA members, just for old time's sake. With the wind behind us and the ebb longer and stronger than the flood, we made good time down the river and were rounding Smith Point with the current behind us by 5pm. As we predicted, once we made the turn we were in heavy beam seas for a half hour until we could get into the lee of the neck. We turned in at the first opportunity, Ingram Bay. Several rivers and creeks come together to form Ingram Bay, all of which are probably worth exploring in nice weather. 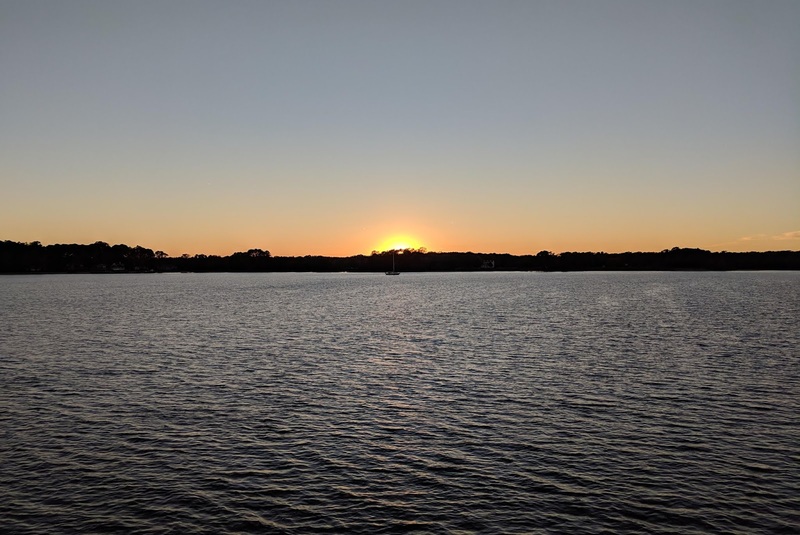 On our mission to get south, we just wanted the closest convenient anchorage, and so we headed up the Great Wicomico to the first empty bay, just behind Sandy Point. A sailboat who preceded us into the river anchored just ahead of us, and we had the anchor down just as the sun started to dip below the treeline. Unlike our wild night on the Potomac, this anchorage was dead calm and we had a relaxing dinner and a very quiet night. Ship's clocks we set back first thing in the morning to mark the end of Daylight Savings, and we had the anchor up before 8 for a very long day to Norfolk. The weather forecast on the lower Chesapeake for tomorrow is unfavorable, and so it was make Norfolk today, or hunker down someplace like Yorktown instead. Today's forecast had been for one-footers in light wind, but as we cleared out of Ingram Bay we found ourselves in square three-footers on the port beam. After we made our southerly turn they were a bit abaft of beam, but still uncomfortable. We adjusted the stabilizers and decided to press on anyway, and now that we are in a narrower part of the bay with less fetch things are much better. We've also had a favorable current most of the day, and the plotter now shows us arriving at the free docks in Portsmouth before 5pm (sunset is now 5:07). 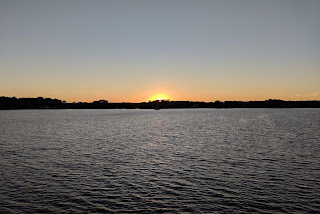 We have backup plans for anchoring in either Willoughby Bay or at Hospital Point if we can't make the distance, but I'd much rather be at the dock, if there's room, and walk to a nice dinner. If it's available we might spend two nights at the dock before moving on. After Portsmouth we will fuel up at one of two places in Chesapeake, and likely spend the next night in Great Bridge. From tonight, we'll be in protected waters until the Albemarle Sound.